Wet chemical fire extinguishers are one of the less well-known extinguisher types. We explain all in our simple guide. Summary: Wet chemical fire extinguishers are the only extinguisher recommended for use with cooking oil fires and are essential safety kit for professional kitchens. Some wet chemical fire extinguishers are also cleared for use on class B fires – those involving flammable liquids, such as petrol, diesel, and paint. 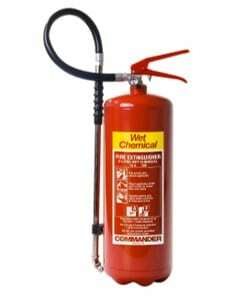 Check the label or ask your fire safety professional before using wet chemical extinguishers on this type of fire. The ‘chemical’ element of wet chemical fire extinguishers is potassium. Potassium salts are sprayed out as a fine mist (gently, so as not to spread the burning oil or fat), and these react to create a soapy film on the surface of the substance on fire. This smothers the fire, with the added benefit that the mist also creates a cooling effect. Pros: the only fire extinguisher suitable for use with cooking fat and oil fires. Cons: can produce toxic fumes areas should be ventilated if a wet chemical extinguisher has been used. These types of business generally also need the ‘standard pair’ of a foam extinguisher and a CO2 extinguisher, so that ALL fire risks are covered. 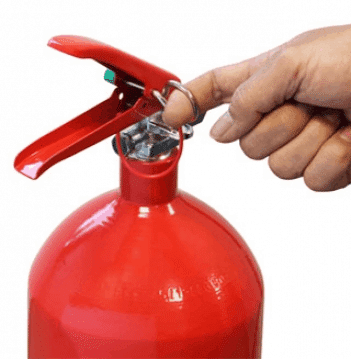 Read more about the different types of extinguisher here. Wet chemical fire extinguishers need to be used very carefully, to avoid splashing burning fat or oil onto surrounding areas. If you think you need wet chemical fire extinguishers, or if you are not sure what you need, just get in touch with our friendly team by calling 0845 845 3001, or emailing info@surreyfire.co.uk. They will be able to arrange a free survey visit for you from a BAFE registered extinguisher engineer. All of our extinguishers come with a 5 year guarantee, and we fit and commission them for you for free.